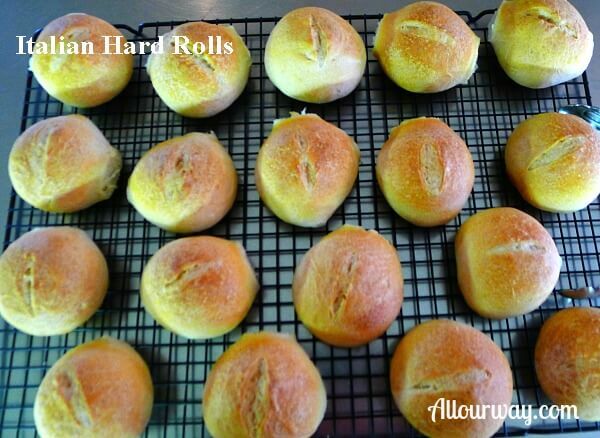 Are you an Italian hard rolls type person, or do you prefer the soft, sort of sweet Parker House type rolls? 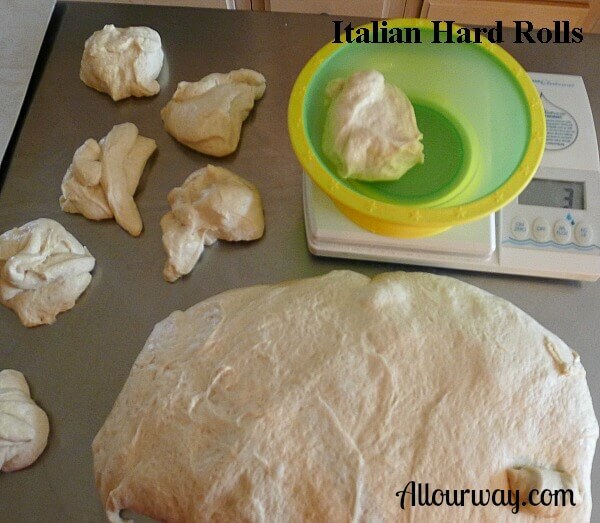 We are definitely of the Italian hard rolls crowd. We like to hear that crackle and crunch when we try to break into them, and the crust is so hard that some of the crumbs fall onto our plates. Oh, but the inside, the inside is so soft, so warm, so light and airy, and so very fragrant with a rich yeasty scent. The pat of butter that we put in the crack of the roll melts and soaks right into the interior crumb. These panini duri Italiani have everything we desire in a roll. It all begins with a starter we make the day before and let it sit on the counter. The following day we add the starter to the rest of the ingredients and knead the dough. Then we place the dough ball into a container and allow it to rise. To get a uniform roll we bench and scale the dough. We are huge proponents of kitchen scales. 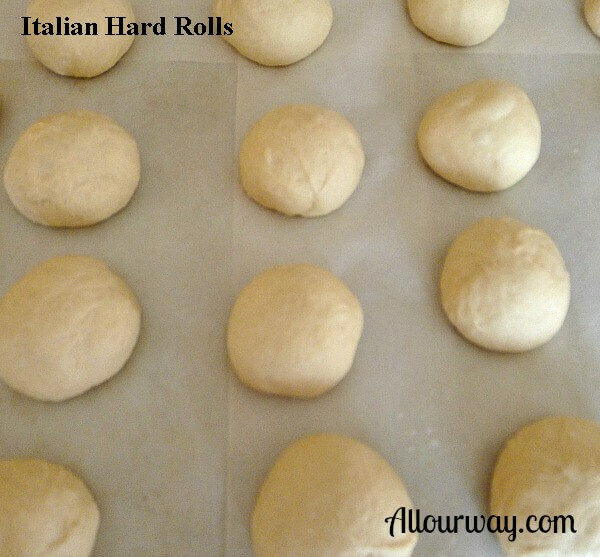 Italian Hard Rolls on Parchment Lined backing sheet. We let the rolls rise for another hour or two. We brush the rolls with an egg white wash.
After we score the rolls, we put them on a baking sheet and then immediately into a preheated 425F oven. The key to these panini’s fantastic flavor is the extra-long fermentation and very little yeast. 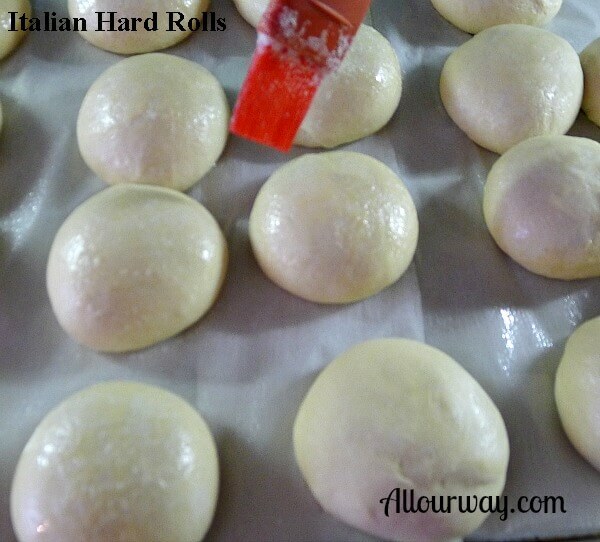 Use them as crispy Italian sandwich rolls. 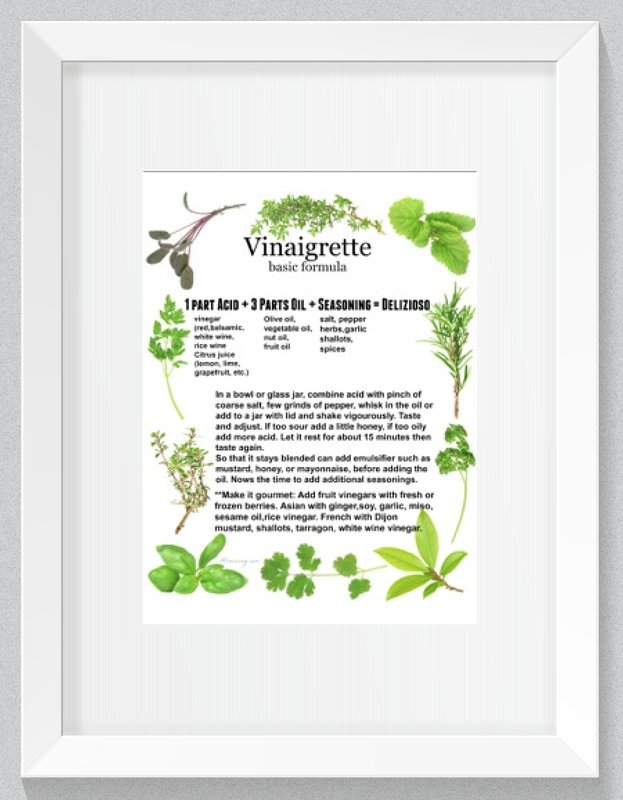 They would make excellent sliders, or you could make them larger and use them for grilled sausage or hamburgers. 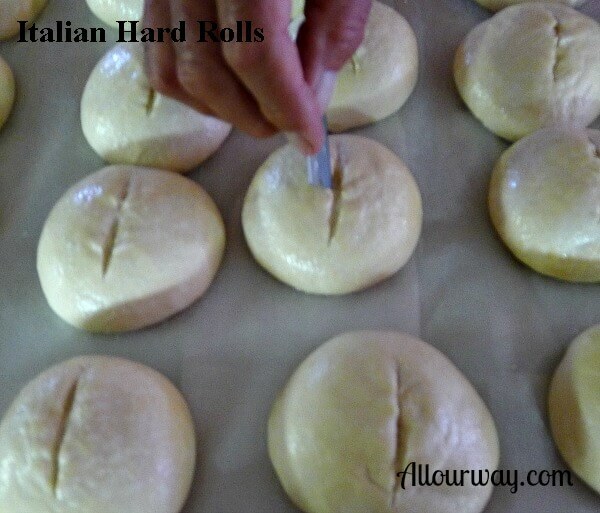 Let us know how you ate these tasty Italian hard rolls. A light airy roll with a crunchy crackly crust. Does not use a lot of yeast, instead it relies on extra-long fermentation for flavor development. To make the starter: Mix the starter ingredients until smooth, cover, and let rest at room temperature overnight. 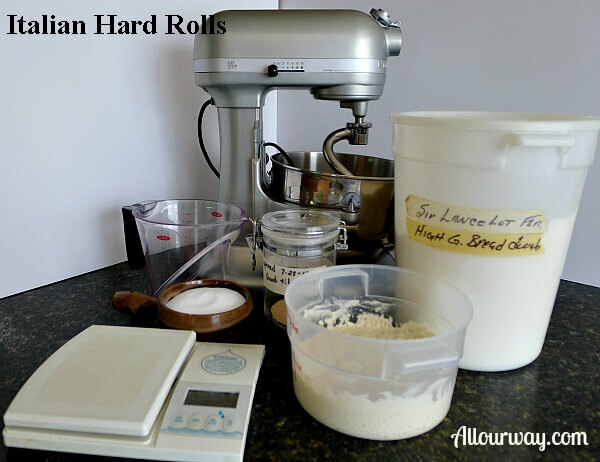 Next day combine all of the dough ingredients and mix and knead them together -- by hand, mixer or bread machine -- until you've made a soft, somewhat smooth dough. Allow the dough to rise, covered in a greased bowl, for 3 hours, gently deflating it and turning it over after 1 hour, and again after 2 hours. 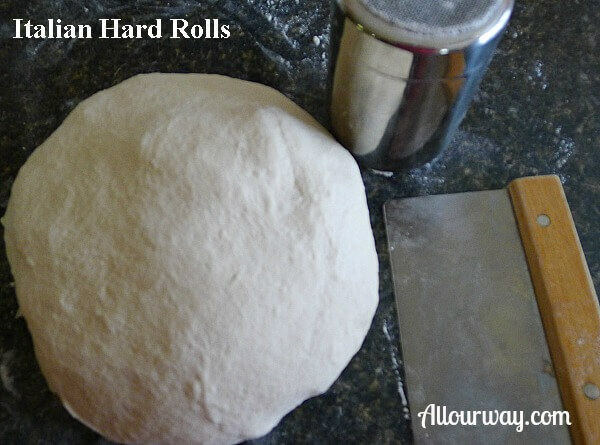 Turn the dough out onto a lightly greased work surface. Divide it into 12 pieces*, shape the pieces into balls, and firm them up by rolling them under your lightly cupped fingers. Cover the rolls, and refrigerate them for 2 to 3 hours. Towards the end of the rolls' chill, preheat the oven to 425F. Whisk together the egg white and water until frothy. Remove the rolls from the refrigerator, and brush them with the wash. They may seem a bit flat but they'll perk up when they hit the oven's heat. Bake the rolls for 20 to 25 minutes, until they're a deep golden brown. Remove them from the oven, and cool on a wire rack. For the best crunch, open the oven door, and allow the rolls to cool in the turned-off, open-door oven. *We never use tap water. We use bottled spring water or distilled. 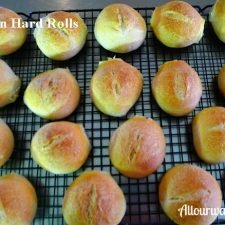 *We doubled this recipe and scaled our rolls at 3 ounces which yielded 18 rolls. I liked this recipe a lot the first time I made it but the second time made it with bread flour and some whole wheat flour, I also added 1/4 tsp of diastatic malt (It gave them a nice shine and a crumbly crust) and they were fantastic!!! Hi, Duke!! We always encourage people to try things out their way — and look at you!! A recipe you like even better – that’s great. I wish I could see a photo. Me and my husband are the hard roll type of person. We are always looking for crunchy bread, that one that make a lot of noise! lol. I am so glad that now i can make them at home! I’m not much of a baker, but your step by step instructions sure do make this sound easy. I would love to try and make these, fresh baked bread is the best! These look so dellicious, I just wanna slap some butter on one and go to town right now… Great idea with weighing the dough as well – I’ve never thought of this before, genius!! Hi, Emmeline! We always scale our dough. It makes for uniform pieces and it’s easy to do. Have a Merry Christmas. Merry Christmas to you too, Claudia! Hopefully, this coming year will be a fantastic year for us. Buon Natale e Capodanno! Un abbraccio forte! I have a question… your recipe calls for AP flour, but your ingredients photo shows Sir Lancelot flour which (if it is King Arthur brand) is high gluten. Which flour should I use? Hi, Linda! We purchase our flour in 50# bags. We use both flours depending on how chewy we want the bread. Not everyone can get the Sir Lancelot flour and the bread will turn out excellent using the KA all-purpose flour, just not as chewy. I favor hard rolls and you are on a roll today. This recipe is definitely a keeper. Hard rolls are hard to beat! We are making the Pane Bianco right now and boy, do I think this is going to be a keeper. I’ll put a picture of it on Instagram and Facebook.